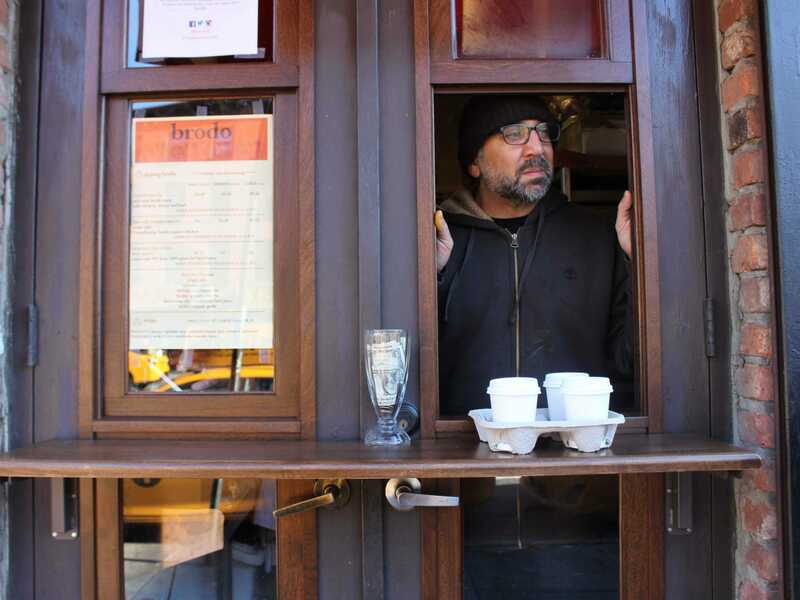 Asta Thrastardottir/Business InsiderChef Marco Canora at the Brodo window. From cronuts to ramen burgers, New Yorkers are no strangers to food crazes. But the latest —a much-hyped, artisanal “bone broth” that’s said to have some health benefits — is stranger than most. To be clear, what we’re talking about is standard broth, like the kind found in any soup. But the savory liquid is having a moment: high-priced, locally sourced, organic versions are now available for purchase, and it’s even a staple of the Lakers’ diet. 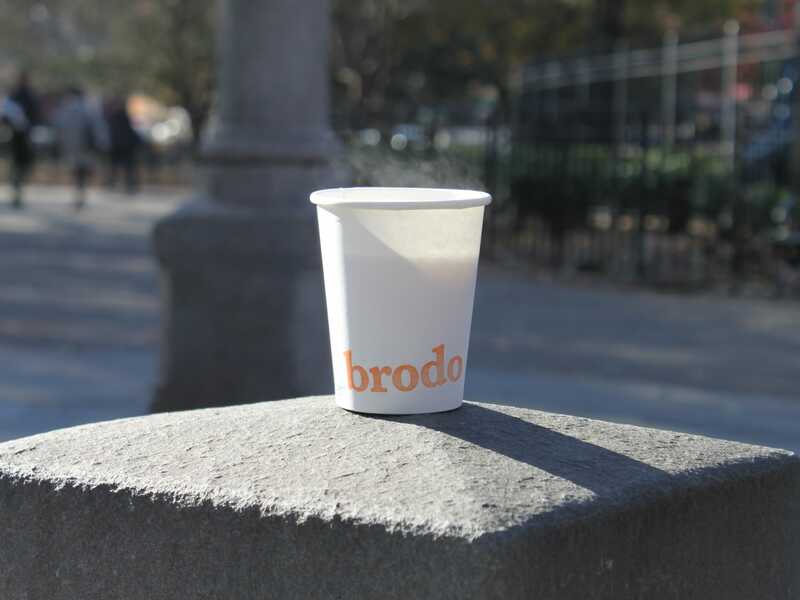 Broth is also the star menu item at Brodo, a new East Village takeout window from “Next Iron Chef” alum and Hearth owner Marco Canora, who has taken the ancient food and made it trendy, offering it in a various flavours and slow-roasting the bones. He’s selling it in cardboard coffee cups, which cost $US4 for a small and up to $US9 for a large. Canora has also made some steep claims about the benefits bone broth, writing a column for Vice titled “I Was an Insane Chef Until I Started Drinking Broth.” While there are no proven effects from drinking it, proponents say broth does everything from drawing out toxins to soothing digestion and erasing wrinkles. Billed as winter’s answer to the legendary “green juice,” we knew we had to try it as soon as possible. Asta Thrastardottir/Business InsiderBrodo offers three kinds of broths: hearth, organic chicken, and gingered grass-fed beef. Broth all by itself sounded a little too plain, so we asked Canora to add the mix-ins he thought went best with the various flavours. We ended up with organic chicken broth with beet kvass (fermented beet juice), hearth broth with ginger juice, and beef broth with turmeric. 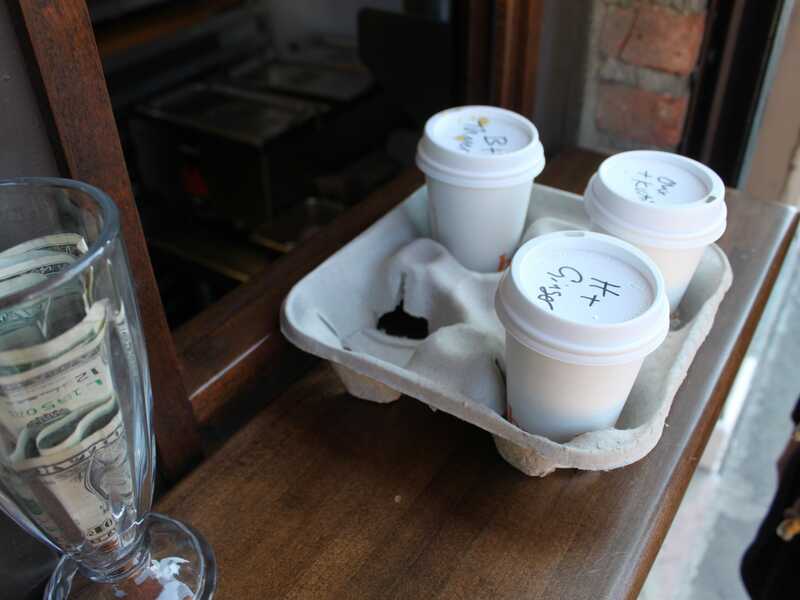 Since we ordered three broths, we were offered a coffee carrier for easy transport. It seemed clear Brodo was aiming to supplant coffee in New Yorkers’ winter weekday routine. Other add-ins we could have chosen included calabrian chilli oil, shiitake mushroom tea, and Keith’s organic garlic. Each of the add-ins cost an extra 75 cents. Asta Thrastardottir/Business InsiderThe beet add-in made the chicken broth turn a deep red colour. 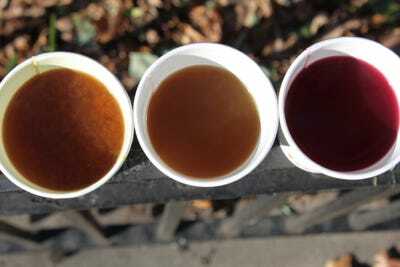 The chicken broth with beet kvass didn’t look like broth — it had a deep red beet colour instead of the usual pale brown. This broth had a nice, delicate chicken-y flavour that mixed well with the beet kvass. The taste was reminiscent of a good chicken soup, which was very comforting on a cold day. 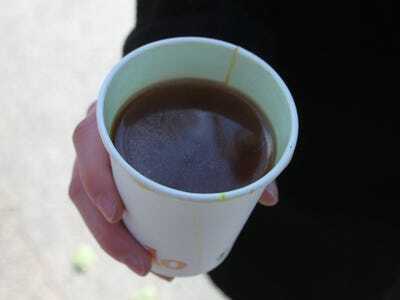 Dennis Green/Business InsiderThe gingered beef broth is made with New York State grass-fed beef bones. The beef broth was by far our least favourite — even the balance of turmeric wasn’t enough to fix it. It had an unpleasant taste that was reminiscent of meat, but not in a good way, and was hard to sip on. We ended up throwing this one away almost completely unfinished, as neither of us could stomach it. Dennis Green/Business InsiderHearth broth is made with a combination of chicken, turkey, and beef . Hearth was probably the most flavorful broth on its own, but the ginger add-in was completely overwhelming. Too much ginger left the broth a bit hard to drink, and we struggled to get more than half of it down between the two of us. Still, aside from the heaviness of the ginger, hearth ended up it had a great overall taste. Asta Thrastardottir/Business InsiderIt was like a warm cup of soup — without any of the substance. We did feel invigorated after drinking the broth, but it was probably just from the warmth of the liquid. Though bone broth is touted as a health food that can detox, soothe stomachs, stop wrinkles, and deliver key nutrients, there’s so far very little scientific evidence to back up these claims. We’ll admit that bone broth is more substantial than a cup of coffee; however, it still didn’t taste like much more than meat-flavored water with fancy add-ins. After trying all three, we both felt a little queasy. It did nothing to placate our before-lunch hunger and actually had the opposite effect. After the queasiness wore off, we immediately went out for cheeseburgers. 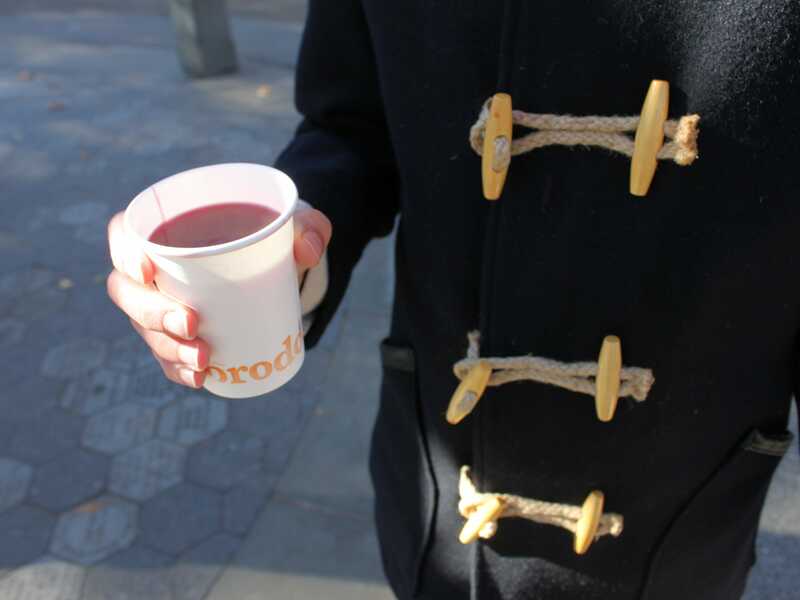 Still, if we were looking for a warm pick-me-up while on the go, we could see ourselves grabbing a cup. Just not the beef flavour.